For over 30 years, Medicine Man Compounding Pharmacy has been dedicated to improving our patients’ lives through individualized medicine. Because we understand that no two patients are alike, it is our mission to provide the highest quality of care for our patients as individuals. 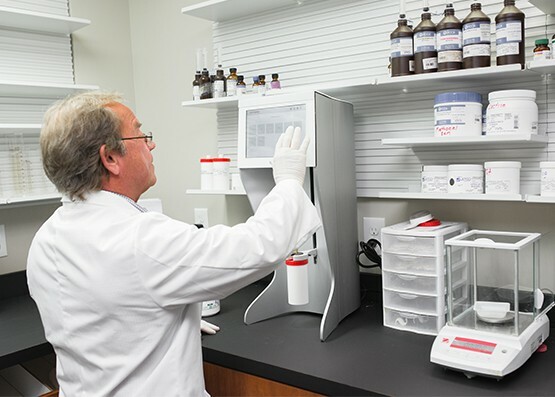 As a dedicated pharmacy team, we have blended the tradition of pharmacy compounding with the pharmaceutical advances of the future to create our unique compounding practice. This process of creating medications that are specific to each individual allows us to provide more than the standard one-size-fits-all approach. Working in partnership with your physician, we educate patients and recommend therapies and medications that are unique to you, the patient. Born and raised in Lafayette, Louisiana she is a Cajun at heart! Becky graduated from Texas A&M with a Bachelor of Science in Nutritional Science, Molecular Experimental emphasis. She later graduated as PharmD with Summa Cume Laude from Xavier University, New Orleans in 2006. Before acquiring Medicine Man Compounding Pharmacy she enjoyed pharmacy retail for eleven years. Rick graduated from the University of New Orleans (UNO) in 2003 with a Bachelor of Science in Naval Architecture and Marine Engineering. He took off his engineering “hat” to become the store manager, running the day to day pharmacy operations. He enjoys meeting the patients, getting to know them and seeing their health improving with each visit. Francis “Frannie” Farmer was born and raised in Allendale, South Carolina. He graduated from The University of South Carolina College of Pharmacy. Frannie had been working in the retail chain pharmacy stores before coming to Medicine Man. He is an avid South Carolina Gamecock Fan and enjoys fishing in his time off. Born and raised in Charleston, SC she is a true local and grew up on the Isle of Palms. Michelle received her LPN from Roper Hospital School of Nursing in 1997 and then continued her education to receive her RN from Florence Darlington Tech in 2001. Michelle has worked at Medicine Man Pharmacy for many years and loves helping men and women to achieve their goals. Michelle enjoys seeing the positive changes she sees in the clients when their hormones are replaced to youthful levels.